The pipes which carry water to our homes have a long history that stretches from rock-cut pipes to today’s PVC pipes. Early water pipes, believed to date from 4,000 to 3,000 BC, were discovered in Mohenjo-Daro near the Indus River Valley. Archaeologists believe that plumbing technology developed concurrently in Babylonia. The excavation of a Babylonian temple revealed pipes and pipe fittings which had been formed by applying clay to wooden mandrels and allowing them to harden in the sun. 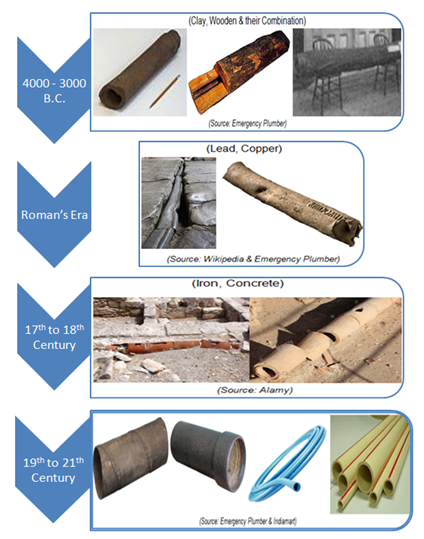 The Romans also made major contributions to the evolution of pipes: stone-cut pipes, copper pipes and bronze and lead pipes have been attributed to the Romans. Historians report that the first Iron pipe was installed in Germany in 1455. In 1664, a 15 mile pipe was installed to pump water to the fountains near the king’s palace in France. 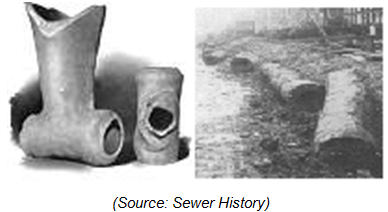 The first underground sewer was installed in 1728 and the first concrete pipe was installed for sanitary use in 1842. Reinforced concrete pipes were introduced by J.Monier in 1867. Plastic pipes were introduced in 1966 as that versatile new material became more advanced. An early patent in the field of water delivery pipes was filed in April 4, 1919 by Ernest Tribe. Tribe applied for a patent on a coupling to join pipes. In 1925, Frederick H. Bedford and James H. Hayes acquired a license for the invention and started producing it as the Victaulic coupling, a product of the Victaulic Company of America. In 1931 Victaulic couplings were used to minimize leaks at Hoover Dam, the most ambitious engineering project of the time. The company went on to handle such renowned projects as China’s “Bird’s Nest” Olympic Stadium and the world’s tallest building (as of this writing), Burj Khalifa in Dubai. A quick patent search shows that pipe-fitting patent activity in last ten years remains fairly steady, with just a slight upward trend. By contrast, the trend is definitely upward for pipe-fitting applications which specify – or at least mention – the use of PVC (polyvinyl carbonate). PVC was invented twice in the 19th century; once in 1838 by Henri Victor Regnault and again in 1872 by Eugen Baumann. In both the cases, vinyl chloride was left exposed to sunlight which converted it to PVC.